Need to secure something with a lag bolt? A security fastener isn't very secure at all if the bits are available at a local hardware store. Penta-Plus™ and STYKFIT®7 are Bryce-exclusive keyways, which means that the corresponsing driver bits are not sold retail. Key-Rex® is even more secure, with a keyway shape that is exclusive to you. Just like a custom-created lock, you'd be the only one who has the key. We can also make them with standard drives like Hex or Penta head, for lower-value applications. Our stainless steel lag screws are made with Raptor™ Button Heads - oversized heads with serrations on the underside that grip into the substrate, allowing even higher torque than the already high torque of our exclusive keyway designs. 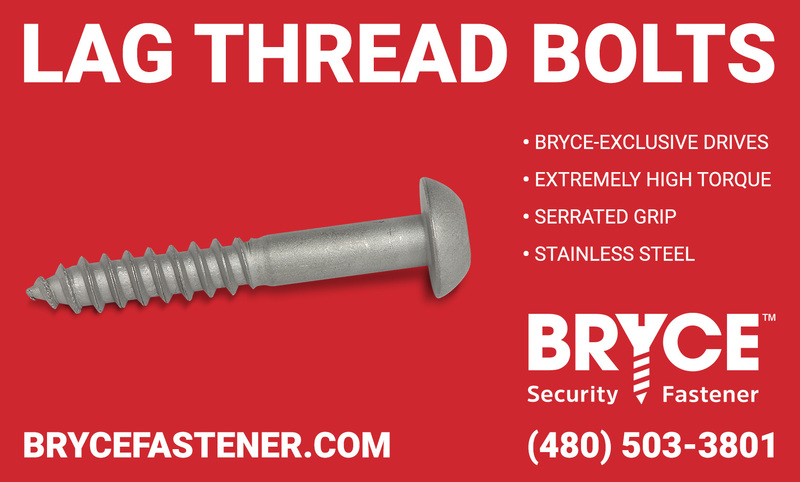 Perfect for high-torque applications like pre-drilled plastic, pressure treated wood, concrete lag inserts, or any other situation that requires a security lag bolt.